Companies that provide free lunch for their employees have higher overall satisfaction ratings. And if you want to improve employee connections, ties are stronger between employees who share lunch frequently. Intercompany networking is generally deemed a plus. Companies that provide free lunch for their employees have higher overall satisfaction ratings. Bob is stressed to the max trying to navigate his way to the local Burger King during lunch hour. His stress is relieved when he realizes there is an employee luncheon. Also, businesses may be eligible for tax benefits. These all help booster productivity and promote health… both of which you want your co-workers to have for a conducive work environment and are more likely to happen with a catered lunch verses the fast food experience. Taking a break for lunch is an inspirational way to regroup for better concentration and creativity in the day. 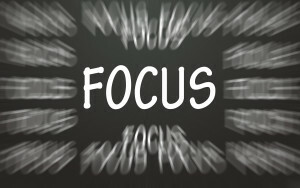 Being in the moment is similar to the act of mediation when it comes to clearing our minds so that we can return to the topic we need to focus on with better expertise later. If the luncheon is an enjoyable experience, co-workers are more likely to center on the delicious meal before them and not panic over the next looming deadline. Plus, moving around, even walking to the luncheon room helps clear the mind and promote healthy living. Brain foods equal brain power. 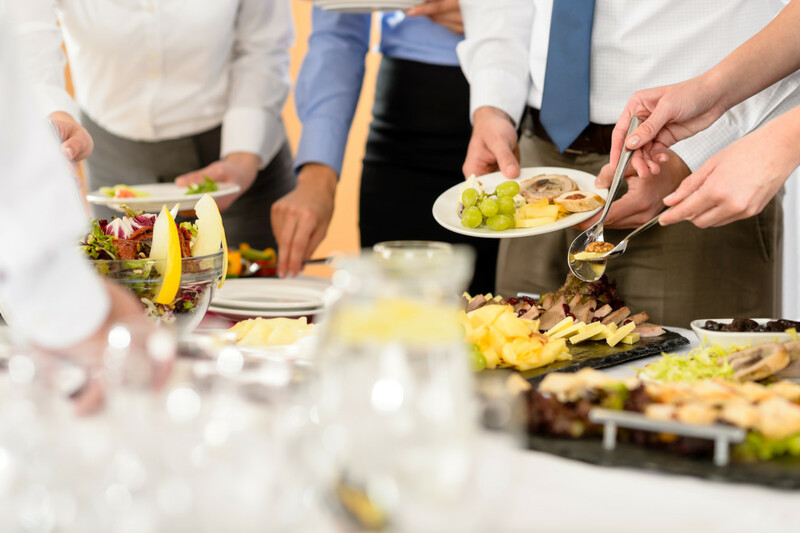 When it comes to planning an office luncheon, especially for a large group of people, a professional catering service is the best course of action. While DIY lunches are an option there is plenty of planning to a spectacular and delectable office luncheon. You will want a caterer with prolific expertise in preparing fresh food, cooking it, and serving it with provided dishes and utensils. Let’s not forget napkins, glasses, and the supervision of lines. Serving large quantities of people can be daunting, but utilizing the experienced team at Moncla’s allows you to sit back and enjoy the moment. 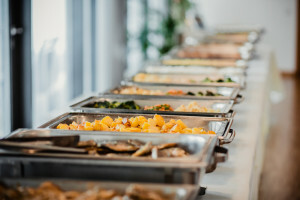 And of course you want a catering service that setups the luncheon and cleans up afterward so your full stomach can return to more important matters. Moncla’s has a wide variety of dishes sure to liven your appetite from southern lunches like etouffee and jambalaya to the tried and true Tex Mex wrap. For vegetarians, they even offer salads with delicious side dishes to make your Momma envious. There is also plenty to choose from when it comes to wetting your palate with an ice cold drink or roasted coffee. You will have the best service to choose from between four catering packages. Moncla’s has grown since 1950 to become the largest catering company in Southeast Texas specializing in upstanding catering. The backbone of Moncla’s is their service to the industrial market through safety meetings, open houses, and luncheons. For extensive company events of 6,000 people or more, Moncla’s cooks on site. They have an incredible reputation for satisfying customers since 1918. 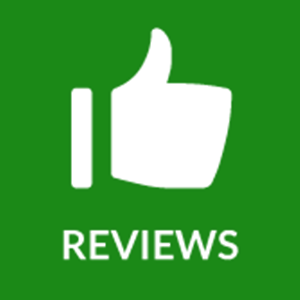 Moncla’s is experienced enough to get the job done and yet family-owned with consideration in mind. They have worked with petrochemical plants in Southeast Texas and Southwest Louisiana for many years. During their time as catering professionals they have maintained a reputation for preserving the safety clearances and credentials required to serve at these facilities. For best service, call twenty-four hours in advance. Moncla’s service and platters are certain to leave your stomach full and your taste buds more than satisfied for you and your co-workers.